Cake Boards There are 5 products. 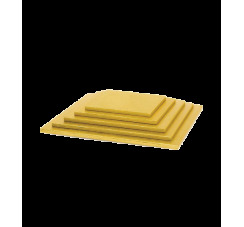 Carton cake boards are extremely useful trays when preparing a cake or present it at the table. The cake boards are circular or square cardboard trays, suitable for serving cakes at a party. The practicality of these cardboard cake trays is that they are durable and disposable. Therefore, there is no risk that the precious tray will be lost in the hustle and bustle of a party. In fact, with these trays, transporting your cake will be extremely easy. Circular or square cake boards also serve as a shelf to decorate a cake. In fact you can mount the different layers of cake directly on the cardboard tray. These trays can also be mounted on polystyrene structures to create raised shelves on which to place multiple cakes creating a spectacular and wonderful effect all your guests present your creativity. 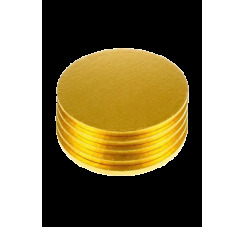 The carton cake boards are of silver or golden color and are suitable both for round cakes and for square cakes. They are useful in all circumstances, even for serving sweets or pastries. With these cardboard trays you can, in fact, build a solid pyramid of cream puffs or mount a multi-story cake. The cardboard cake boards are very popular trays even in the art of cake design and pastry shops. In fact, they are preferable due to the fact that they are disposable. Carton Cake Boards are often used to set up shop windows with the so-called fake cakes, that is to say bases in polystyrene coated with sugar paste, simply used for display purposes. With the cake boards you will not have to worry about finding a nice tray of the right size, as these trays are available in different sizes. The circular cake boards have a diameter of: 25 cm, 30 cm, 35 cm, 40 cm, 45 cm and 50 cm. While the square cake boards measure 25x25 cm, 30x30 cm, 35x35 cm, 40x40 cm, 45x45 cm and 50x50 cm. Choose the size you need and start decorating your cakes! 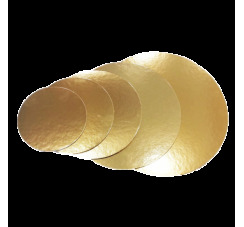 Silver circular cake board, choose your size The silver cake boards are cardboard plates suitable for serving your cakes. These cakes boards have the distinction of being single-use, so they are suitable for transporting cakes without worrying about bringing the tray back home. 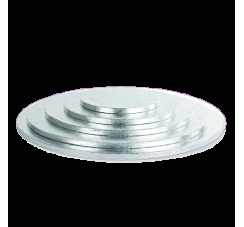 The silver circular cake board is available in different sizes, choose the one that best suits your needs. Save moneyFor orders of € 90.00 i.v. you'll get a discount of 10% of the total purchase. Silver square cake board, choose your size The silver cake boards are cardboard plates suitable for serving your cakes. These cakes boards have the distinction of being single-use, so they are suitable for transporting cakes without worrying about bringing the tray back home. 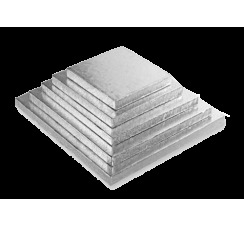 The silver square cake board is available in different sizes, choose the one that best suits your needs. Save moneyFor orders of € 90.00 i.v. you'll get a discount of 10% of the total purchase.